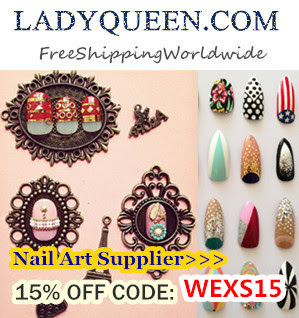 Lady Queen is an international beauty shop, selling nail art,make-up and tools, jewellery, fashion bags etc. They offer free shipping all over the world. Here is a link to their nail art department where they have tons of nail art related items: stamping plates, glitters, rhinestones, dotting tools, brushes, foils and many other items. As I mentioned in my previous post I personally think that they offer the biggest selection of nail decalls, but besides that they offer a wide variety of stamping plates. On of those I'll review in today's post. Today I'm going to present you hehe 050 stamping plate,where it currently costs 2,99$, but with my coupon code you can get if with 15% discount for 2,54$. Since it is an all over design there is a lot of different options, and you can create many looks with this plate. I tried 2 different designs with this plate and I had no problems with stamping. The image transferred well, and didn't smudge. I tried to stamp all parts of the plate and I haven't notice any "bad" spots, so I can say that it is really well engraved. Because it is an all over design I had a lot of options in my mind. Because the heart design is too big for my nails I used it a bit differently (as a V shape stamping), This is a big advantage because if you regularly want to stamp this way you have to protect the rest of the nail with a tape or liquid latex. It is relatively cheap comparing to some other stamping plates. I really like how many options this plate offers. 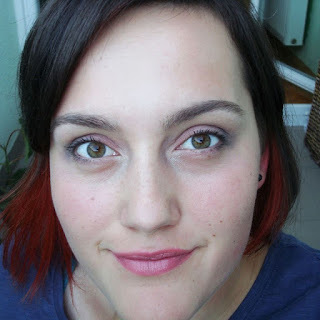 you can make a Gothic design with bold colours or something delicate and girly with light colours. I think it is a must for every woman to have this plate in her collection. For all of my readers Lady Queen offered a coupon code for 15% discount. Use WEXS15 at the checkout. This product was sent to me for reviewing purpose. See my disclosure.